As I reflect on yesterday’s distillation of 12 evolutionary intelligences that serve cities, I can’t help but think that there are things for us to do and ways for us to be to allow these intelligences to flourish. If these intelligences flourish, then so will citizens and cities. See the whole city, the good and the bad. Notice the systems within the city system, and the systems of cities. Integrate of the four integral voices of self and the city: citizens (psychological well-being), city managers (biological well-being), city builders (social well-being), and civil society (cultural well-being). Take action with the knowledge that our cities are alive, and extensions of us. Make decisions with the knowledge that we shape our cities and our cities shape us. Nourish our cities with our curiosity and catalytic connections. Name our destination – the relationship we wish to have with our cities. As I look at these points, I see that living these intelligences means knowing where we are going and not knowing where we are going at the same time. It means being certain in uncertainty. It means trusting ambiguity, and seeing clearing in ambiguity. It means embracing the gifts of differing opinions. It means being the citizens we need to be to have cities that serve us all well. It means courageously having a destination in mind, even if only a thread. It means accepting that as individuals and as a species we are on a learning journey. It means being open to the future that is wanting to come into being and trusting that the future we want is the future we can have. 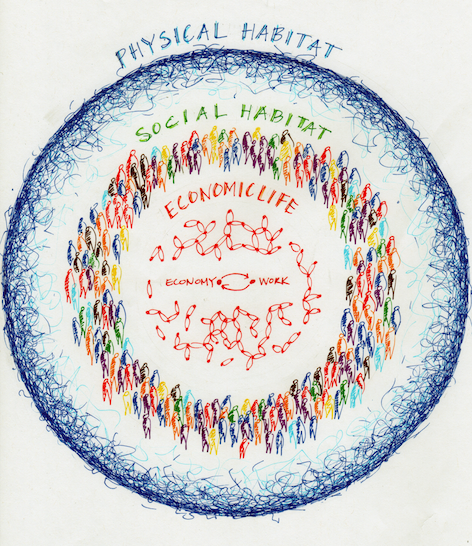 It means organizing ourselves and our habitat – our nest cities – to thrive. As I leave this post with you today, I am at the end of Chapter 3 – The Thriving Impulse. 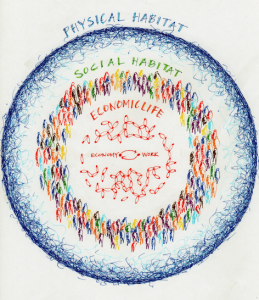 Beginning with my June 13, 2012 post, Pause for evolutionary understanding, I explored some theoretical frameworks to shed some light on our evolutionary relationship with cities: Spiral Dynamics and Integral Theory. My next post will begin the transition from city patterns – our impulses to create cities and organize them so we thrive – to how we can go about organizing ourselves in our cities for emergence. Over the last several weeks I have been exploring Marilyn Hamilton’s 12 evolutionary intelligences for the city. They cover a great deal of territory and are so interconnected. I often find it difficult to grasp and discern the 12 intelligences and I am hungry for a simpler way to ‘hold’ them. 12 are too many for my being to juggle. Let me unpack this sentence and reach back into each of the 12 evolutionary intelligences explored over the last few weeks to see how they fit, how they add up to this sentence. Seeing the whole city means using ‘maps’ to look at the city as a whole. Integral intelligence means looking at the city with integral maps. Four of these maps are explored in earlier posts. Here they are, with links to a description of them: the nesting holarchy of city systems and Spiral Dynamics integral; the four quadrants and scalar, fractal relationships. Cities grow out of our evolving interaction with our habitat. Our ecosphere intelligence allows us to be in relationship with our habitat and adjust and grow with it as life conditions change. When we engage our living intelligence, we see that the city is alive because its survives, it connects with its environment and it regenerates. If it doesn’t do this, it does not survive or thrive, but dies. Our emerging intelligence allows us to city the aliveness of the city and its complexity. The city is made up of many other whole, identifiable systems: citizens, families, organizations, neighbourhoods, etc. The city survives just as these systems survive, has a relationship with its environment as these systems do, and regenerates as these systems do. The relationship between the city system and its systems are always in relationship with each other, which creates the conditions for our evolving intelligence. The back-and-forth between cities and citizens, for example, fuels the development of all wholes. Cities and citizens alike need to be nourished to thrive. Inquiry intelligence allows us to unlock the potential of cities by simply noticing and appreciating what works in cities and working to get more of it. Inquiry also gives us the opportunity to imagine what we need that is well beyond “fixing”. A “fix” keeps us where we are, but curiosity about what naturally needs to come next, and the inquiry into that, is hugely nourishing. Asking and exploring questions endlessly nourishes our cities. Then connections we make in cities, and the quality and quantity of those connections, also nourish the city. This is meshing intelligence, our capacity to make catalytic connections within and between whole systems. These relationships are self-organizing and hierarchical at the same time. The health of both nourish the city. Our navigating intelligence allows us to inhabit two behaviours – aiming for a destination and the activity of discerning if on course to that destination. This intelligence is all about feedback loops, and the creation of feedback loops that allow us to see whether our actions are helping or harming our journey to where we wish to go. This intelligence is increasingly asking us to know where we wish to go and what “getting there” would look like. cities that serve citizens well, and citizens that serve cities well. In a very general way, this phrase is what we are aiming for. It is a superordinate goal. As all of the intelligences weave together, and as we spend time contemplating what a city that serves its citizens well looks and feels like, or how citizens that serve the city well would show up, we will begin to identify what this relationship is really about. Ultimately, this relationship is emerging and it will continue to emerge as the relationship between citizens and cities shifts and adjusts over time. Organizing our cities requires a clear sense of destination to which we navigate. We are on a journey to make our way to this destination, yet the truth is we do not know what the destination really is. It is both clear where we are going and unclear. We have a sense of direction, yet we recognize that where we will end up has yet to emerge. Our destination, our journey and the emergent quality of our travels are all because of the 12 evolutionary intelligences, and supported by them. It’s a big trip we are on. How do citizens create the city? How do cities create citizens? There is a back-and-forth relationship between these two elements. Cities and citizens co-evolve together. As one shifts and changes, so does the other. The whole city system and all the systems that make up the city are constantly adjusting, readjusting to the changing conditions surrounding them. Our physical environment is changing, our biology is changing, our psychology is changing, our culture is changing. Our very consciousness is changing. Citizens and cities are co-evolving. Seeing the city as a whole system of whole systems reveals an emergent, evolving system. Seeing systems reveals interconnections and non-linearity. Non-linearity helps us live with, prepare for and anticipate the unexpected. Having muscles for the unexpected creates resilience. Greater adaptability means greater survivability. Greater survivability means more joy, expansion, creativity, potential. The very relationship between our species and the habitat we build for ourselves serves our evolution. Understanding this is allows our intelligence to evolve. Understanding our relationship with our habitat – both given to us and created by us – allows us to thrive. My next post will distill the 12 evolutionary intelligences into bite-size pieces. I just got back to civilization yesterday afternoon after spending four days in the backcountry hiking Skyline Trail near Jasper, Canada. 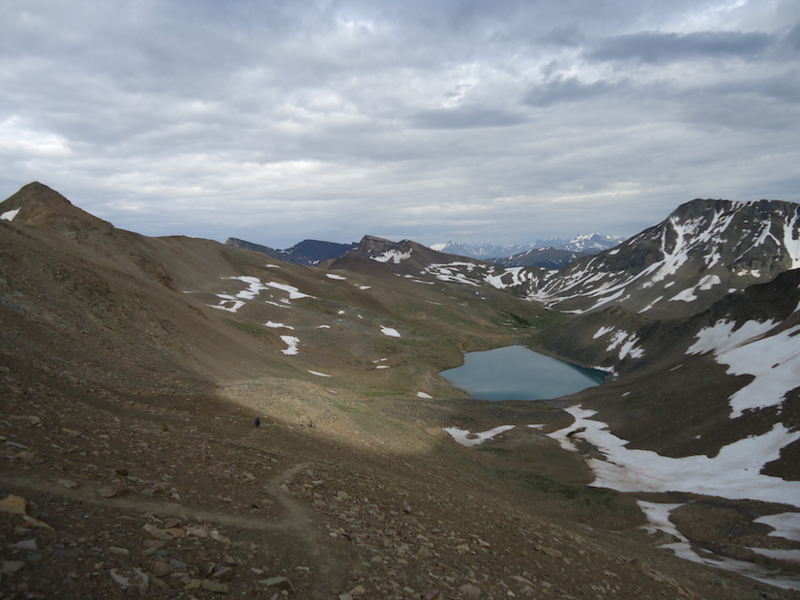 We hiked 46 km in varied mountain terrain – up an old fire road, around mountains, over mountains, through mountain passes, down into valleys, through alpine meadows and a 4.5 km stretch simply along the skyline with a 360 degree view of of the Canadian Rockies. I was far removed from the city, yet one simple, familiar premise about cities kept popping up in my mind as we hiked: humans settle where the habitat is suitable. The hikers: We were two families of four. Eight of us ranging from grade 4 to early forties. We chose to take three or four days for the hike. Many hikers take two or three days; we met a running group who were doing the trail in one day. We gave ourselves the option to spend an extra night and have a fourth day in case we needed (which is what we did). Our navigation aids: We travelled without GPS. We knew the trail would be obvious. We also knew there would be people on the trail with information on the trail ahead of us. We had good topographical maps so we could monitor landmarks and determine our general position. Our challenge: We did not know exactly where the camps were located. None of the maps we could find showed precisely where the ‘settlements’ were. We knew how far to hike to get to each campsite, but we had no way to measure specifically how far we had hiked and how far we had to go. On relatively flat terrain, we know we move at about 3 km / hour, including a break. We were travelling very irregular terrain and our time estimates for distance were off. Signage with distances to campsites were only at campsites, not in between. Our challenge was when we were getting tired we needed to know how much farther we had to go. The trail and the campsites are described by Parks Canada as primitive. These are very basic places to settle for a bit and they are fully in relationship with the surrounding habitat. 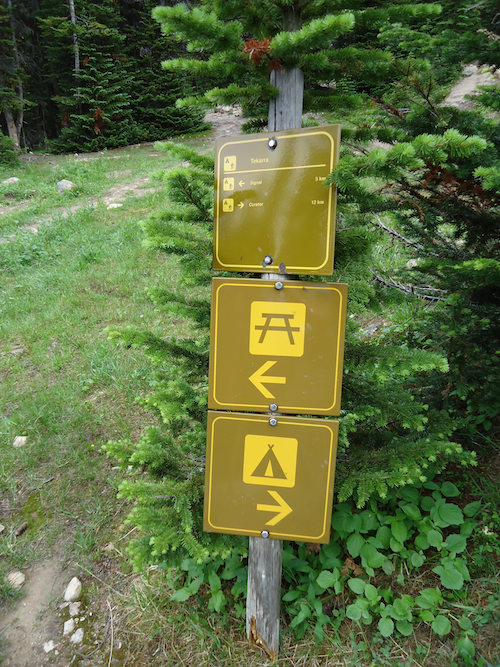 The way the sites are organized are for primarily the safety of hikers – the places we prepare and store our food are entirely separate from where we will spend the night. This is for our safety and the wildlife. A suitable settlement takes into account its surroundings – its habitat – and the needs of the settlers. In today’s life conditions, we are not looking to establish new settlements. We are recalibrating our settlements – our cities – to suit our needs. Increasingly, we are are again taking into account our relationship with our surrounding habitat. We are making our way toward suitable settlements and finding new ways of navigating that will ensure we reach this goal. We just need to know what we are aiming for. My next post will put me back on track with my exploration of 12 evolutionary intelligences in our city life. How can we optimize the life of people in the city? How can we optimize the life of the city in people? Our ability – collectively and individually – to do the above is an indicator of health, illness or death. The cycle of life is alive in cities, just as it is in us. I believe that cities are alive. Just as we can recognize in ourselves, they are “constantly learning to adapt and survive under all possible life conditions: stable, stormy/unsettled, turbulent, clear .” Cities battle to be healthy and thrive. Cities battle forces that work against them from time to time and when savvy will adjust to changing life conditions to survive and thrive. This is complex work for cities, as they are complex systems. Nothing linear is at work here. It is a web of meshes that is full of both hierarchies and self-organizing systems. Order and chaos. Over the course of several posts I have been exploring, one by one, the 12 evolutionary intelligences for cities proposed by Marilyn Hamilton. I have three left. Today’s post is about navigating intelligence: whole-system feedback processes. As I have been exploring the qualities of cities and what drives their evolution, there is one very clear pattern: feedback. Feedback ensures that we are able to know and understand our world, and this is a very important factor when we consider that our world is always changing. It is crucial that we understand the changes that are taking place, understand the adjustments that are needed, make those adjustments and confirm if the adjustments have the desired effect. None of this is possible without feedback. Our work, our constant efforts to think, make and do new things, drives our economic life and is, in fact, the force that creates cities. This takes place in the context of our physical habitat. Cities start where they make sense, where there is water, shelter, food and a resource on which to build an economy. As the settlement grows, our work also becomes the physical making of the city. Our social habitat is the glue – it is where, and through which, feedback travels, telling us when times are changing and new methods of farming are needed, or that communication via computers is possible, etc. Feedback loops are absolutely critical in the relationship between humans and our habitat. The quality of our habitat depends on it. The quality of our lives depends on it. Our ability to thrive depends on it. We are moving into a new era where the possibilities of having the means to monitor how are cities are doing is totally possible. Cities I worked with several years ago slaved to have performance indicators to tell them how there were doing in relation to housing, water quality, education, etc. But it was hard to get that data and confirm that it was accurate and politically defensible. As data becomes more and more open, there will be more and more citizens and organizations examining the dynamics of their cities and pointing out what works and what does not. A new era of noticing city dynamics is soon upon us. A new era of feedback on how well our cities serve us is coming. Here is nifty 5 minute video on Analytics 101 you might find helpful. As you listen, think about how the vast amount of digital data can help us create savvy cities. For example, Daniel Haight, founder of Darkhorse Analytics, found that closing emergency service stations in cities results in better service. There is insight in data, should we choose to look and ask questions. There is insight in data, and we now have an abundance of data and abundant access to data. The next question is what we hope to do with the data we have. What questions should we ask? What insight do we want and need? Where do we want to go with our cities (ie purpose)? What do we need more of to get there? This whole business if feedback requires us to be prepared to ask questions and receive answers. And also prepared to respond as needed. It requires bravery and courage. It is a necessary skill to ensure that we are able to navigate our way to cities that serve citizens well. The hard part will be articulating the purpose of our cities – our destination – and what success looks like. Then we will be equipped to navigate our world and dynamically steer our cities into the future. My next post will focus on living intelligence and the insight of life cycles in cities. This image is from a 2010 article on 3D imagery showing the brain’s circuitry in the highest resolution yet (follow this link to Stanford Medicine’s YouTube video. Essentially they have taken 700 nanometer slices of a mouse’s cortex and mapped the connections. Even with the new imagery, the result is a level of complexity seen in the brain that is hard to comprehend. Our cities, as our creations, are as complex. There is much that we can’t see, and lots of what we can see is hard to comprehend. “A human cerebral cortex holds about 125 trillion synapses, which are connections among neurons, packed into an ultra-thin layer of tissue. That’s equivalent to the number of stars in 1,500 Milky Way galaxies…These electrical interfaces are found throughout the brain, control our thinking, feeling and movement. Whether looking at our brains inside us, or the cities we build outside of us, it is clear that despite the fact that there is no one element or person that is in charge, clear patterns emerge. All of our brains are so alike that we recognize ourselves as a singe species. Our cities also take remarkably similar shapes independently. The pattern that emerges from both of these environments is that chaos and order exist simultaneously. The city, just like a brain, needs hierarchy and order to build itself. The order is scaffolding. Once the scaffolding is in place, the city self-organizes itself in numerous, infinite ways by making connections. It is an amazing combination: the ability to forever reinvent as well as the ability to sort and choose . The value of meshworking – the ability to make catalytic connections – in cities is that it enables whole system thinking. This is work that naturally takes place in our cities and it is a work that we can choose to enhance to nourish our cities’ emergence into what they next need to be for us. It requires establishing new order when old hierarchies are in need of recalibration. It requires establishing new connections at every turn to nurture our self-organizing. All of this is about our collective learning together to create habitats that meet our needs. Cities are full of hierarchies and self-organizing systems. The challenge in our work is to find the balance, each and every moment, that meets our life conditions. Always at the appropriate scale. There is so much more to say about meshworking. You may be interested in Hamilton’s work: click here for her web site, here for her book. As I conclude this post, I realize that yesterday’s post about inquiry intelligence, and this post about meshworking intelligence, are two types of evolutionary intelligence that nourish the city that is wanting to come into being. We are in a new era of communication (think social media, internet etc) that is building whole new ways and kinds of connections between cities. This is certainly a new form of scaffolding (order) we are building for ourselves in our cities. It is also creating the conditions for new ways for citizens to self-organize. A new city is emerging. I wonder what it is. Tomorrow’s post will explore another evolutionary intelligence for cities: navigating intelligence.